Our ‘Ponton’ at Santa Fe Classic Limo was ordered from Germany & imported in 1958 by a California customer and served as a family car until 1994. ‘Edmond’ as the car is affectionately known was brought to New Mexico for extensive restoration in 2010 and now resides in Santa Fe. You will find the car’s custom wood interior styling, solid wood dashboard, roomy back bench seat, comfortable, smooth ride, and chrome accents all for your cruising pleasure. The Ponton was Daimler-Benz’s first totally new Mercedes-Benz series of passenger vehicles produced after World War II. In July 1953, the cars replaced the pre-war-designed Type 170 series and were the bulk of the automaker’s production through 1959, though some models lasted through 1962. 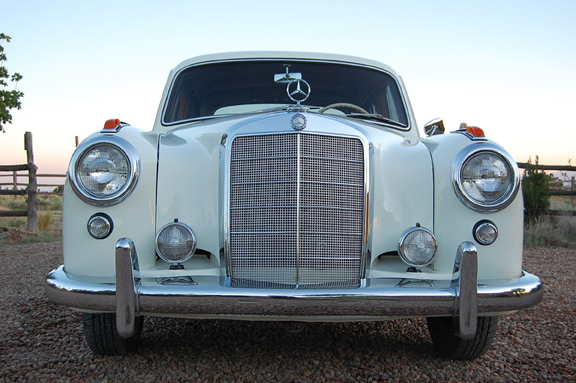 The nickname Ponton comes from the German word for “pontoon” and refers to one definition of pontoon rounded fenders — and a postwar styling trend, subsequently called ponton styling. Until October 1959, 55,279 220S sedans and 3,429 Cabriolets and Coupés were built.